It is a privilege to work alongside Sponne student council and I’d like to tell you about how student voice contributes to Sponne School and its wider community. The council meet at least twice a term to discuss any important issues and deliver feedback from their year group council meetings. Strategies for raising awareness of anti-bullying messages are a focus for this academic year and students are committed to improving the well-being of individuals in school and those in the wider community. 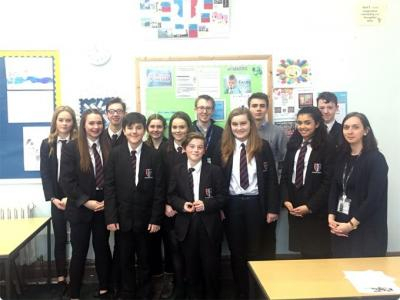 Student council is a fantastic opportunity to contribute ideas and makes changes with council members involved in a range of activities from fund-raising and improving the school environment to being part of the interview process when appointing new teaching staff. Sponne student council are an integral part of school-life and their contributions both as individuals and as a group are vital components of student voice here at Sponne. At Sponne, we believe it is important to get the voices of our students across. Many important topics at school are often discussed with the team. This “makes students more important so they can make more choices” (Reggie, year 7). We have school council meetings roughly once a term followed by year council meetings and then issues are discussed in form groups before they are brought forward to the school council once more. In form time, two members of the form, usually a boy and a girl are elected by their peers to represent them in their year council. Out of the form representatives, two are chosen by the year group to be on school council. This, not too different from our own country’s politics system, helps students such as Isobel (year 9) to “understand team work in more depth” and how politics work, in a safe school environment. In turn, this “allows older years to be made aware of issues in younger years and vice versa and so they can be asked for advice” (Brina, year 13 Head Girl). This helps to make a community spirit in Sponne where students can ask for help from others when they are unsure or unhappy. According to Holly in year 10, school council “shows different people and what their opinions are.” Everybody in the school is represented on school council so ideas can be shared and expressed. School council aims to let people share their thoughts and opinions, without being judged and as a school this is very important for us in order to make sure students feel safe and welcome. Deputy Head boy Luis (year 12) finds that “important issues are discussed in a neutral environment” something the school is glad to have. Ideas and issues we are currently discussing include: raising awareness of Mental Health and this included a balloon launch which the school council took part it; the school’s anti-bulling teams and how they are combating bulling and raising awareness of it around the school; the BBC school news report where current students are making a small report speaking about bullying, well-being and mental health; and feedback we have received from younger years about diversity at Sponne and how we can promote it. At Sponne, we are very lucky to have a working and active school council. It gives a “great platform for the student body” (Elaina, year 10) and it is “getting the student voice heard” (Martha , year 11). We hope that our school council will continually make improvements to our school in the future so other students make feel it’s benefit.